Jeff Maggert stares down a five-footer for birdie on 18 at the 2019 Hoag Classic. WARNING: The following video may cause emotional distress and could negatively impact your golf game for years to come. Such an alert is necessary in light of Champions tour pro Jeff Maggert’s disastrous 18th hole on Friday, where he five-putted from five feet to make a triple bogey. 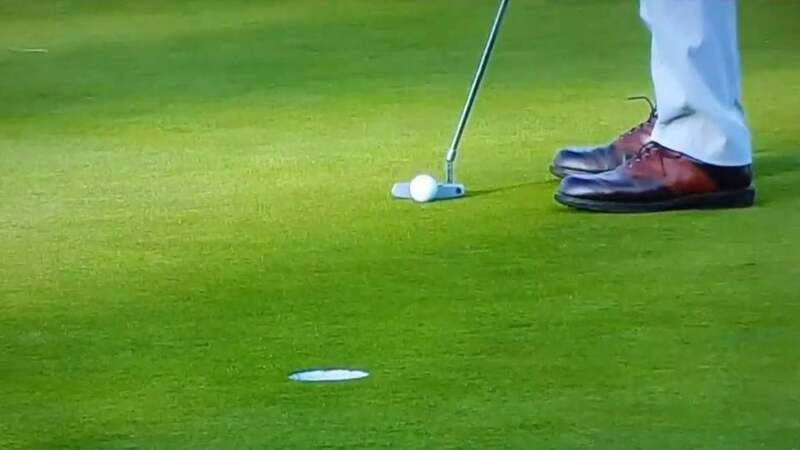 The golfing catastrophe occurred in the opening round of the senior circuit’s Hoag Classic on Friday in Newport Beach, Calif. Maggert, a 55-year-old veteran of the PGA Tour, was grinding out a ho-hum round of two over through 17 when he gave himself a great chance to get a shot back at the closing hole. Maggert’s approach shot on 18 found the putting surface and settled just five feet away. A birdie seemed like a foregone conclusion. But, alas, it was not to be. Maggert’s first putt was on a good line and nearly dropped before skirting past the right side of the cup. But the putt had too much pace on it and ran a good four feet past the hole. His comebacker for par wasn’t a bad stroke either, but it lipped out and stopped three feet away. Then things got really ugly. Now visibly frustrated, Maggert hastily addressed his bogey putt and drilled it, once again missing and leaving himself with a five-footer for double bogey. As you can see for yourself below, he missed that one as well. When Maggert finally walked off the green and shook hands with his playing partner, his birdie had turned into a triple bogey, and he was forced to scratch a dreaded 8 into his scorecard. The triple dropped Maggert to five over for the tournament, leaving him T66 after round one. It wasn’t a pretty sight for Maggert, but at least he didn’t pull a Phil Mickelson at Shinnecock Hills and make a bad situation even worse.